OfficeCalendar offers two Maintenance & Upgrade Protection Plans to choose from for your OfficeCalendar installation: Premium and Standard. Both plans offer access to all of our first-class support features, which are outlined below. However, the Premium Plan is the only plan to offer OfficeCalendar Online, a hosted service that allows you to access your personal and shared Outlook calendar, contact and task folders via the web from anywhere at any time. Both Premium and Standard Plans are two-fold service plans that include technical support for the OfficeCalendar software product as well as free OfficeCalendar upgrades for the plans’ durations. 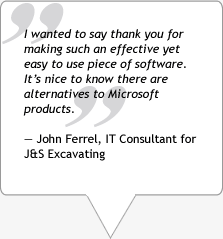 Each OfficeCalendar Free Trial installation includes the Premium Plan during your trial period. Not only will you enjoy free unlimited trial support and assistance from our comprehensive resources and highly-experienced staff, you can benefit from all the features of OfficeCalendar Online, where you can access your Outlook folders via the web. For more information about free trial support during your trial period, scroll down to the section below OfficeCalendar Free Trial Support. However, you must sign up using the form presented after the OfficeCalendar trial download is complete to receive free trial period access to OfficeCalendar Online. 1. Unlimited 24 hour a day, 365 days a year, access to Lookout Software's online support knowledge base. The online knowledge base includes FAQs on the usability of OfficeCalendar as well as common technical scenarios that may be encountered while using OfficeCalendar. 2. Online interactive trouble-ticket system. Submissions are accepted 24 hours a day, 365 days a year. Trouble-tickets submitted are reviewed during normal business hours (Mon - Fri, 9am - 5pm CST) and responses are generally received within 2 hours or less (if received during normal business hours). 3. Phone support - Phone support is available during normal business hours (Mon - Fri, 9am - 5pm CST). Escalation of a particular trouble-ticket to phone support is solely at the technical support department's discretion. In order to have a technical issue addressed over the phone, one must have already submitted an online support ticket. In addition to the 12 months of technical support assistance outlined above, the purchase of the Premium Plan or the Standard Plan also includes, free of charge, all OfficeCalendar updates and upgrades released during a customer's 12 month plan period. Customers who elect to not purchase either the plan with the purchase of their original OfficeCalendar licenses may opt to purchase the OfficeCalendar upgrades at a later date for $39.95 per license. 1.Unlimited 24 hour a day, 365 days a year, access to Lookout Software's online support	knowledge base. The online knowledge base includes FAQs on the usability of OfficeCalendar as well as common technical scenarios that may be encountered while using OfficeCalendar. 2.Online interactive trouble-ticket system. Submissions are accepted 24 hours a day, 365 days a year. Trouble-tickets submitted are reviewed during normal business hours (Mon - Fri, 9am - 5pm CST) and responses are generally received within 2 hours or less (if received during normal business hours). 3. Phone support - Phone support is available during normal business hours (Mon - Fri, 9am - 5pm CST). Escalation of a particular trouble-ticket to phone support is solely at the technical support department's discretion. In order to have a technical issue addressed over the phone, one must have already submitted an online support ticket. If escalated to phone support, a technical support representative will contact you or your trouble-ticket will be updated with the technical support phone number. Also included with each 14 day free trial of OfficeCalendar is online web access to your Microsoft Outlook calendars, contacts and tasks for your entire team through OfficeCalendar Online. OfficeCalendar Online is an easy-to use service that allows each of your team members access to their personal and shared calendars, contacts and tasks online while away from the office via an internet browser. You must sign up using the form presented after trial download to receive free trial period access to OfficeCalendar Online. To continue using OfficeCalendar Online after your trial, you must purchase Premium Maintenance & Upgrade Protection Plans for all licenses. 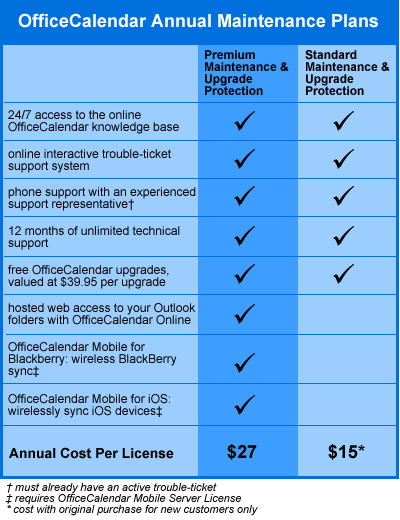 Access to OfficeCalendar Online is not included with the Standard Maintenance & Upgrade Protection Plan.